When a living person interacts with the spirit world, anything can happen. 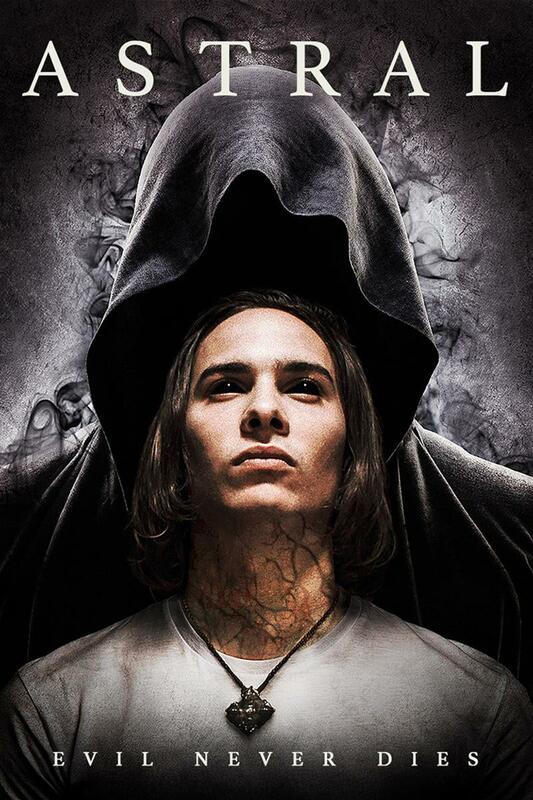 Astral, starring Frank Dillane (Fear the Walking Dead), will have a theatrical run as well as hit several digital platforms on November 23rd. Also: a look at COMET TV's full November guide, Evil Intent's Amazon release details, and info on Miskatonic Institute Horror Studies - NYC's "Ha! Aaah! The Painful Relationship Between Humor and Horror." Astral Release Details: "Coming to terms with the explanation of his mother's untimely death, Alex turns to spiritual contact after the relationship with his father breaks down. As a student of metaphysics, Alex learns of the "scientific" premise of astral projection-the ability to project your spirit into an unseen spatial dimension. Attempting to astral project, Alex becomes plagued by shadow spirits-malevolent entities vying to enter his body to access our world. Alex soon learns that he is not the only member of his family to have been besieged by such beings, as his mother's dark past is brought to his attention. ASTRAL was co-written by Chris and Michael Mul and is Chris Mul's directorial debut. The film stars Frank Dillane (FEAR THE WALKING DEAD) and features a bright up-and-coming cast of young actors. The film has a running time of 83 minutes and will not be rated by the MPAA. Vertical Entertainment will release ASTRAL in a multi-city theatrical release with markets including LA and NY among others on November 23. The film will also be made available on digital platforms such as iTunes, Amazon, Google Play, Xbox, Fandango Now, Direct TV, Dish Network and through local cable providers." Here’s a tip, if you see a garbage can shaped like a spaceship, head the other way because the Garbage Pail Kids are coming! The popular 80s trading cards come to life, learning the good and the bad with Mackenzie Astin as the hapless Dodger. Just make sure and stay downwind of Windy Winston and out of the line of fire from Valerie Vomit! When there’s crime, and you need someone to take care of business there’s only one man for the job… Charles Bronson! On CHARGE! In November is the Brawlin’ Bronson Marathon! Three classic Charles Bronson movies sure to get your adrenaline pumping! Friday, November 30 10/9 C"
Evil Intent Amazon Release Details: "Stephanie and Kelly are best friends and roommates. Paul is Stephanie's boyfriend and Kelly's former boyfriend. The three of them eventually realize they are part of a love triangle that's filled with love, betrayal, insanity, and murder. Starring Libby Baker, who has appeared on the Emmy Award-winning Modern Family as well as Up All Night starring Will Arnett and Christina Applegate." For more information, visit the film's Amazon page. "Ha! Aaah! The Painful Relationship Between Humor and Horror" Class at The Miskatonic Institute of Horror Studies - NYC: "The Miskatonic Institute Horror Studies - NYC welcomes Emmy-nominated comedy writer David Misch to the school for an expansive class on the unique and longstanding relationship between horror and comedy - unlikely siblings that may just be closer than you ever imagined. From 1920’s Haunted Spooks to Pride and Prejudice and Zombies, the genre of horror-comedy has never really, you should excuse the expression, died. Yet humor and horror seem pretty different; one’s a pie in the face, the other’s an ax in the skull. It’s obvious why watching someone being torn asunder would be horrible but why is the endless suffering of the Three Stooges funny? Could there be any congruencies between funny and fear, snickers and screams, gore and gags, slapstick and slaughter? This class proposes – carefully while remaining alert and well-armed – that the two genres are not mortal enemies. For one thing, people in pain are a perennial part of every art; to be fascinated with human suffering is to be human. Both comedy and horror can show us how to live (and, of course, die); from Psycho we learn that Death can come to anyone at any time. Also, to always shower with a friend. The class will examine horror’s relationship with philosophers’ explanations of comedy: Immanuel “Carrot Top” Kant’s Incongruity Theory (it’s funny when two things that don’t go together go together); Sigmund “Shecky” Freud’s Relief Theory (comedy is a rapid expulsion of tension); Thomas “Nutso” Hobbes’s Superiority Theory (“You’re in pain and I’m not – ha!”); Henri “Giggles” Bergson (comedy requires “a momentary anesthesia of the heart”); and Mel Brooks (“Tragedy is when I cut my finger; comedy is when you fall into an open sewer and die”). We’ll explore the mechanics of both using video clips and examples ranging from Frankenstein and Dracula to Abbott & Costello, and try to figure out what makes us laugh and/or scream. We’ll see that both genres love the loss of control, anarchy, the breakdown of rules and conventions – the beast within us set free. And both exploit our paradoxical feelings about helplessness: seeing someone out of control can be hilarious (a clumsy person falling) or horrifying (a clumsy person falling into a snake-pit suspended over a shark-pit next to a zombie zoo). Both humor and horror also share a mordant view of our relationship to pain; an obsession with the human body and its multifarious fluids; and a subtext of death and transcendence underlying the eviscerated flesh and fart jokes. What could be more blood-curdlingly fun? David Misch has been a comic folksinger, stand-up comedian and screenwriter; his credits include the multiple-Emmy-nominated “Mork & Mindy”, the Emmy-losing “Duckman”, the Emmy-ignored “Police Squad!”, the Emmy-engorged “Saturday Night Live” and the Emmy-ineligible “The Muppets Take Manhattan.” David’s written Funny: The Book and A Beginner’s Guide To Corruption; he blogs for The Huffington Post and appears in the anthology Horrific Humor and the Moment of Droll Grimness in Cinema: Sidesplitting sLaughter. His play “Occupied” is in development at the Skylight Theatre in Los Angeles. David’s taught comedy at the University of Southern California, musical satire at UCLA, and spoken about comedy at Oxford University, the Smithsonian Institute, the University of Sydney (Australia); Yale, 92nd St. Y, the Actors Studio, New York Public Library, American Film Insitute, Grammy Museum (Los Angeles), Lucasfilm, Austin Film Festival, Midwest Popular Culture Association and VIEW Cinema Conference (Torino, Italy). More at davidmisch.com"
Named for the fictional university in H.P. Lovecraft’s literary mythos, the Miskatonic Institute of Horror Studies is an international organization that offers university-level history, theory and production-based masterclasses for people of all ages, founded by film writer and programmer Kier-La Janisse in March 2010, with regular branches in London, New York and L.A. as well as presenting special events worldwide. The New York branch is co-run by Joe Yanick of Yellow Veil Pictures and filmmaker Jacqueline Castel."